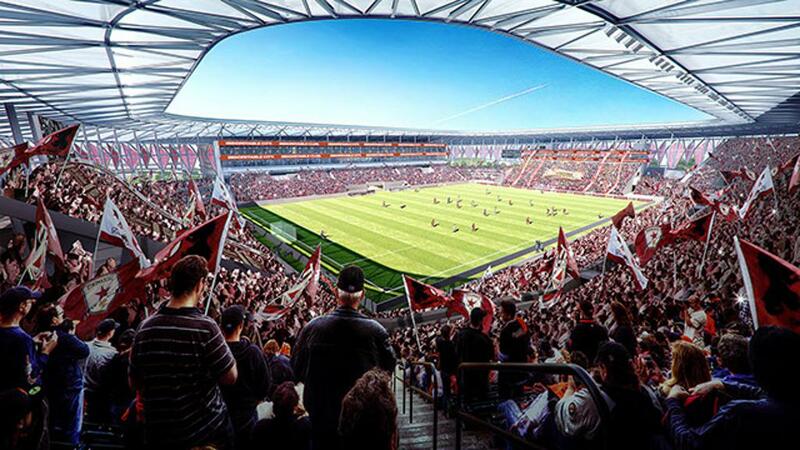 SACRAMENTO, CA (December 1, 2015) – Today, Sac Soccer and Entertainment Holdings (SSEH) released the first images of the proposed Major League Soccer (MLS) stadium designed by acclaimed architecture firm HNTB. The images were launched online at BuiltforSacramento.com. Along with tonight’s presentation of the Preliminary Term Sheet to Mayor Johnson and City Council, today signals completion of Operation Turnkey. The preliminary renderings come after several months of concept design research and development. In formulating ideas for the stadium, the design team drew input from workshops, focus groups with Sacramento Republic FC fans and corporate partners, and an online survey completed by nearly 3,500 members of the public. In addition, SSEH, Legends and HNTB executives toured top MLS stadiums across the country and studied internationally acclaimed soccer stadiums in Europe and South America. Celebrate the Best of Sacramento – The stadium will celebrate Sacramento’s unique aesthetics, neighborhoods and landmarks. The exterior appearance and building structure is inspired by the beveled star in Republic FC’s crest, a symbol celebrating the city’s location as the capital city of California; tree-like structures “grow” at the stadium’s perimeter in a nod to the “City of Trees;” construction materials and proximity to light rail will showcase the site’s roots in the historic Railyards district; and site and landscape design will pay homage to Sacramento’s agricultural heritage. Draw Inspiration From the World’s Game – The design team looked to the best soccer stadiums in the United Kingdom, Germany and South America for inspiration. The Sacramento stadium borrows the concept of neighborhoods from traditional English Premier League clubs by creating four distinct stands, each with its own identity. The stadium’s East Stands will create an intimidating “wall of noise” reminiscent of the Yellow Wall at the Bundesliga’s Westfalenstadion. Inspired by the passionate “hinchada” supporter groups in South America, a separate section, entrance and club will enable Republic FC’s most die-hard fans unique opportunities to showcase their passion. The setup will enable supporter groups, like the Tower Bridge Battalion, to enter the stands together and assemble socially before and after the match. Today’s release represents another milestone in ‘Operation Turnkey,’ an initiative launched in April 2015 by Sacramento Mayor Kevin Johnson, SSEH Managing Partner Kevin Nagle and Sacramento Republic FC President Warren Smith to strengthen Sacramento’s bid for an MLS expansion team. Plans for a new stadium are on track, pending an MLS expansion award to Sacramento, with the facility ready to open as soon as the 2018 MLS season. The fifth and final component of Operation Turnkey – a Preliminary Term Sheet outlining a public-private partnership for the stadium with the City of Sacramento – will receive consideration by the Sacramento City Council at City Hall tonight at 6:00 p.m. This final component will close out Operation Turnkey. The meeting is open to the public and may be viewed online at CityofSacramento.org. For more information about the stadium and Operation Turnkey, including images of the preliminary stadium renderings, please visit BuiltforSacramento.com.